... 1930 (80 years ago today), 25-year-old Laura Ingalls (left) claimed the women's world record for a solo east-to-west trans-United States flight when she touched down at an airport in Glendale, California, 30 hours 27 minutes after her takeoff in New York. (She stopped to refuel and did at least one overnight stay during the sojourn). 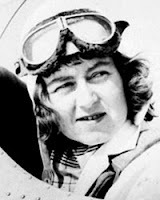 Ingalls had been winning air derby and aerobatics records in the 2 years since she'd begun flying, and she'd go on to claim many more records throughout North and South America (also see here.) The career of Ingalls (no relation to the novelist of similar name) would end in disgrace: during World War II, despite her protestations of innocence, Ingalls served nearly 2 years at Alderson, the federal women's prison, for failing to register as an agent of the Nazi German government.